Our first night in Bangkok, our thoughtful host (the son of the owner of the apartment we rented) asked us if we'd like him to pick us up in his SUV and drive us someplace to get some dinner. He offered our choice of pizza, hamburgers, or fried chicken...he paused there, and could see that we were waiting for something other than food from home. "Or Thai food, or anything you want," he said. We'd love to see a real Thai market! He was enthusiastic about that, and took us straight to an off-the-main-drag neighborhood market about 10 minutes away by car. We saw exactly zero foreign tourists there. The place was jumping. So was the food. Well, formerly. The first dish he offered us was fried grasshoppers. I had thought we might get to see some insects offered as food somewhere in Thailand - perhaps in some remote, rural area - but to see 5,000 bugs for sale, as food, on our first night, was a pleasant surprise. We're in the real Thailand now, I thought. There were 3 or 4 kinds of insects, heaped up by the thousand. I wondered where they caught them all. Then I figured they must be farming them somewhere, raising them in captivity for the express purpose of selling them at the market. That particular cuisine was a little more adventurous than our palettes, I'll admit. But we did enjoy some delicious chicken-on-a-stick (Chicken Satay), with some awesome, freshly blended watermelon juice. We also walked the whole market and saw lots of fresh fish and raw meats (which you could bring home to cook, or have cooked for you on the grill), fresh frogs, something that I suppose was eels of some kind, and a few things we didn't recognize. Our kids absolutely loved the fresh juices from markets in Thailand. We had this almost every day of our trip. Our Bangkok host, and every host we had everywhere in Thailand, assured us that the juice is safe to drink everywhere. They explained that even in markets, even if you don't see any other travelers there, the sellers know that people expect filtered water, and they only use bottled/filtered water when they blend up your smoothies and juices. Mmm, Some Delicious Tar Smoothies Will Really Hit the Spot! 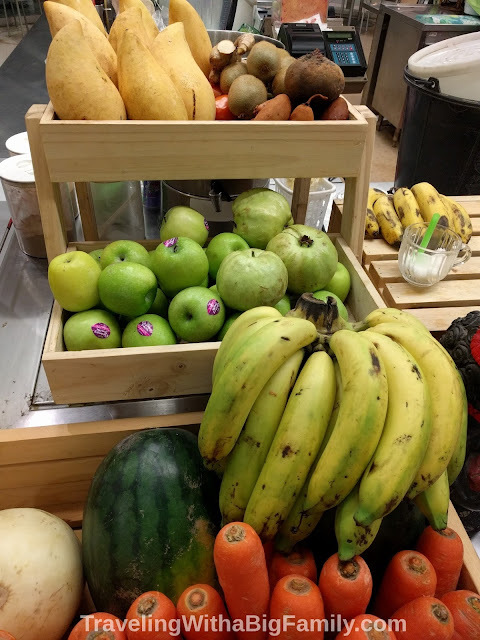 Usually you'll have your choice of numerous kinds of fresh fruits. Sometimes they are laid out in plastic cups and you just point at your cup. Or they'll have large fruits like melons, ready to cut fresh to order. They add all that with safe drinking water to a blender, and mix it up before your eyes. You can specify no added sugar if you like - otherwise they'll usually add some. You'll get a to-go cup and straw - sometimes a lid - filled with juice, for a very reasonable price. So have at it! It's fresh, delicious, and inexpensive. 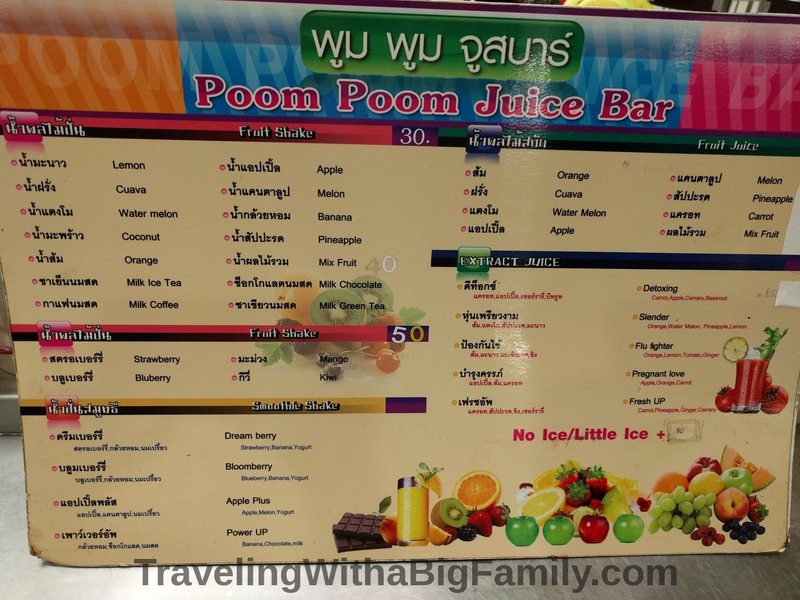 You can't beat juice in Thailand. We have one child who has some serious allergies to peanuts and milk. When he was little, he would get a rash if milk even touched his skin (like if someone spilled some at the table). He's older now but still can't tolerate a milk-based drink. And peanuts are a common garnish in Thai food - served as a dipping sauce for Chicken Satay, or Pad Thai served with roasted peanuts on the plate, etc. He's never experienced trouble breathing, but eating a bite of something like that causes vomiting that goes on for quite a while - it's bad enough to ruin his day, for sure. It's a serious enough reaction that we brought allergy pills with us everywhere, as well as an Epi-Pen just in case (also good to have in case of a sting from a poisonous jellyfish). These little suckers - box jellyfish - kill a tourist every great once in a while. But don't let that scare you - you're in much greater danger driving a car than swimming at the beaches in Thailand. He can't eat peanuts. Make sick, die. Our host recommended the "die" part just to ensure we had the waiter's full attention. He said that sometimes a waiter will give you a big reassuring smile and say "Oh yes, certainly" when you make a special request, but then the request will be entirely ignored in the kitchen, if it makes it to the kitchen at all. So if you have a serious allergy issue, you'll want to be emphatic about the food exclusion, then ask again when the food arrives, then inspect it yourself before letting the child eat. I won't attempt to reproduce the phonetic pronunciation here, because there are a great many subtleties to the pronunciation of Thai, and any one word may have 2 or 3 meanings based on which syllable you emphasize or inflect. So only believe you're saying it right once you've practiced it several times with a Thai person. You could also print out a couple of cards with the phrases in Thai script, if your child's allergy is serious enough that it could cause an emergency or a big issue. Traveling with young children, you may be tempted to pacify them with frequent trips to eat what passes for American comfort food: burgers, fries, and sodas from a familiar global chain. But hey, this is Thailand, ya know? After traveling all that way, why would you want to deprive yourselves of the chance to experience some of the best food on the planet? There's usually just no need to visit Mr. McDonald, or Mr. King, or any of the other fast food chains. They aren't cheap in Thailand, either! You can eat much better, and much more cheaply, almost anywhere else. 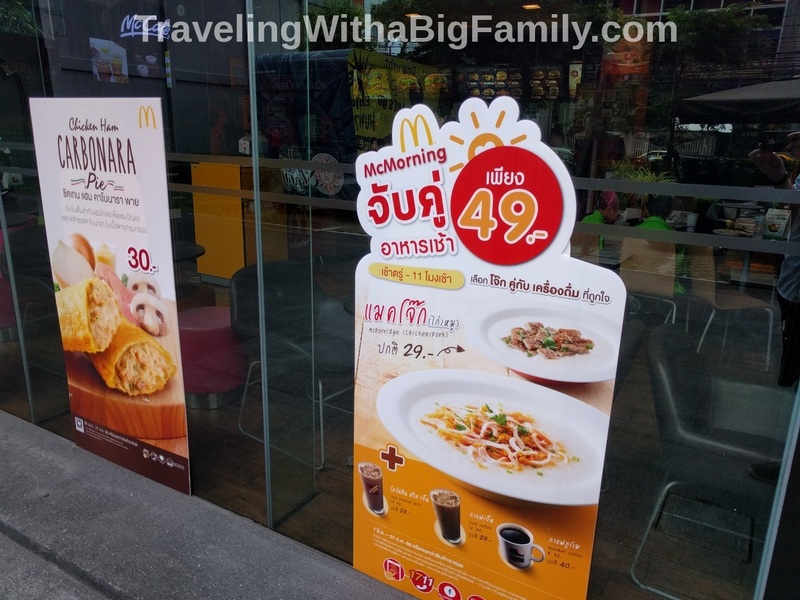 But, I have to fess up: we did have McDonald's in Thailand, and not once, but twice. 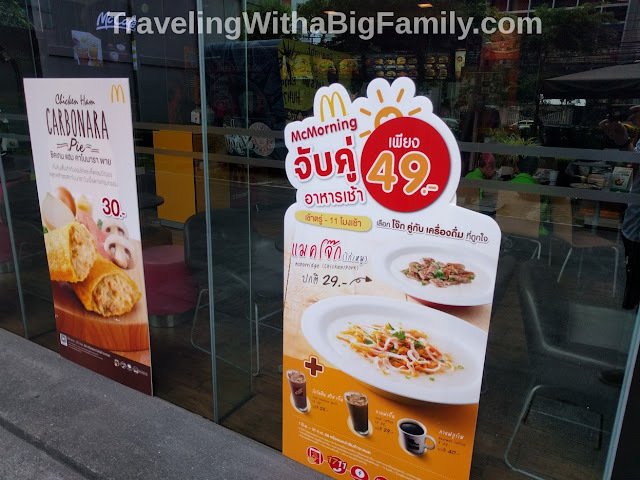 The first time was as we dashed from one airplane to the next, and we ended up grabbing some McDonald's in an airport - at the most crowded McD's I've ever visited anywhere. It tasted almost exactly like the ones at home. All the nearby choices in our airport terminal were familiar chain restaurants. 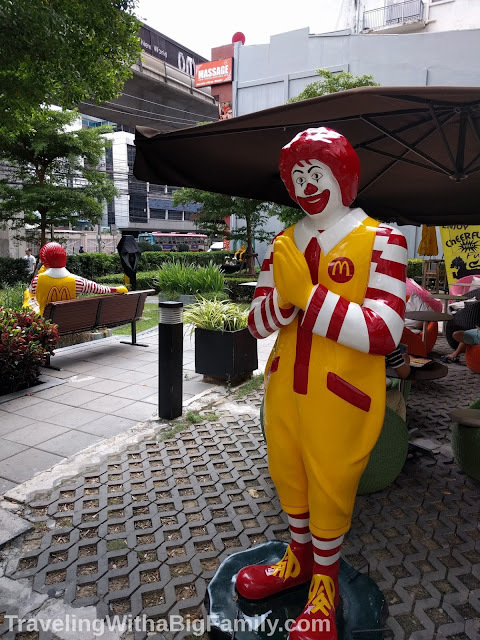 And the second time was in Bangkok, as we were in a heavily commercial area without many options for street food and without any local markets; our only choices were sit-down restaurants and fast food restaurants, and we were trying to get to a museum about an hour before it closed. So we sacrificed one authentic Thai dining experience for the sake of making it to the museum that day. Num-num, McPorridge for breakfast, with chicken or pork, or maybe that is supposed to be read as "chicken/pork." However, we found that the Bangkok McDonald's was not a carbon copy of every other McDonald's on the planet. They had definitely adapted some of the menus to what I suppose they imagine are Thai tastes. 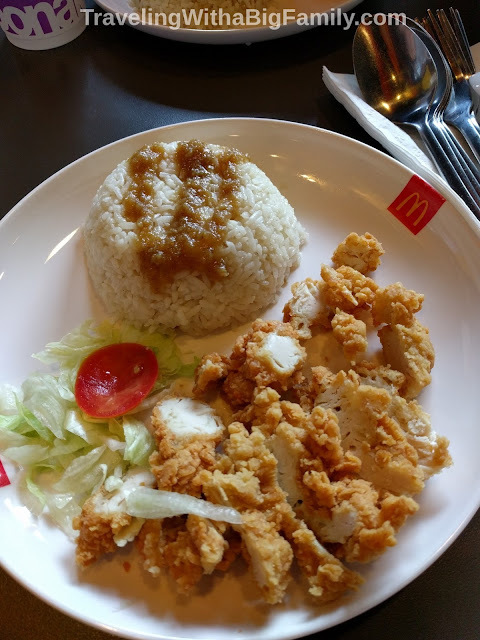 We had a quick plate of fried chicken, which was served diced, with a minuscule portion of green salad and a shaped portion of rice with a delicious garlic sauce on top. Of course, what every travel tip will tell you is to visit street vendors for the best, most authentic, and cheapest Thai food in Thailand. And we did that too. But I think that advice is adequately covered elsewhere...plus, street carts have their drawbacks for big families with young children, such as: the heat, and where to sit for a party of 6. So I'll instead devote time to one of our other favorite options for dining with children in Thailand: the wonderful mall food courts. We found food courts in every mall we visited in Thailand. These mall food courts are ideal places for your family to experience and experiment with different kinds of Asian food. Here's a good example of a great mall food court: CentralFestival Phuket, on Wichitsongkram Road, Wichit, Phuket Town, Phuket, Thailand. Our big family spent about 6 hours here on a rainy day. We arrived after lunch, but we were ready for a snack. We ignored McDonald's and the ground-floor, tourists-only food options. While waiting for a movie to start, we walked 30 seconds over to the 3rd floor's Food Terrace food court. You just need to stop by the little desk at either entrance to buy a prepaid debit card (called a "coupon"). You buy the coupon with cash only. I'd recommend at least 100 baht per person in your group. The deal is, they just need to give you a prepaid (and fully refundable) debit card to swipe so the various food sellers do not have to mess around with cash. I'm sure that's advantageous to all parties concerned, on various levels. At any rate, the food sellers do not accept cash or credit/debit. They only accept the prepaid coupon card. I'm guessing this also lets the mall get their cut of every purchase. It doesn't matter if you put too much on the card, just remember to turn it in when you leave. The cashier will swipe your card to determine its remaining balance, and immediately hand you a full refund in cash of any remaining baht, no questions asked. You don't need to speak Thai for these transactions. If you present the cashier with cash, she knows you want to buy a card. If you present her with a card, she'll instantly realize that you want her to scan it and count out your cash refund. If it's Snack Time for your family, head to the middle islands to get (for 40 to 55 baht each) each person in your family a huge crepe with their choice of filling. We liked the banana, cashew, and chocolate sauce crepes. The kids also tried crepes with rainbow candy bits. The treat will be freshly made before your eyes. 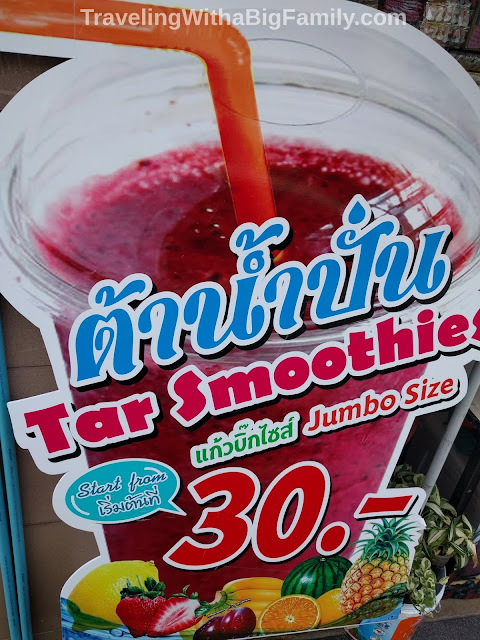 And from another island stall you can get a 30 baht watermelon shake (made from the fruit, sugar, and ice - nothing else - and note that, like water used for juice, ice seems to be safe everywhere in Thailand) or choose from dozens of other flavors, with small variations in price (such as 30 to 50 baht each). After you've wandered the mall or seen your movie, you may be ready for an actual meal. Head back to food court. Walk slowly through the 100+ wonderful choices of Thai, Korean, and Japanese food. This arrangement is the best thing for anyone new to Asian food. 90 percent of food choices are shown with a picture menu (pictures which are surprisingly accurate!) and the item names are written in English and in Thai. Ingredients are laid out fresh for you to see. Many, many locals and employees will probably be eating here - this is usually a great sign that the food is good tasting, and a good value. There are dozens of things that look delicious. 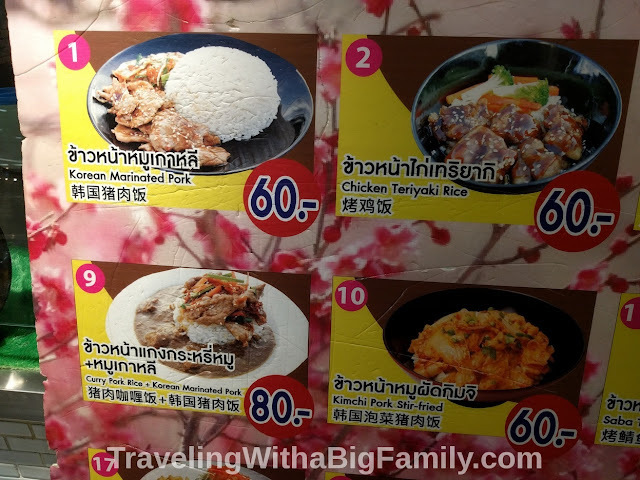 We ate at a lot of Thai restaurants all over Thailand, and had homemade Thai meals too - so being at the food court gave us a chance to try something different, like Japanese, or Korean, or just about any other type of Asian food you could want. I loved the Korean pork with white rice and cabbage from Ozaka Takoyaki at CentralFestival Phuket. The soup place nearby is also excellent. I tasted my wife's soup made of roasted duck with noodles made from nutritious seaweed - and we agreed it was delicious. Portions are smallish, but at these prices you can always get seconds, or try something else that calls your name. The CentralFestival Phuket mall closes down promptly at 9:00 pm and is nearly empty by a few minutes before then. 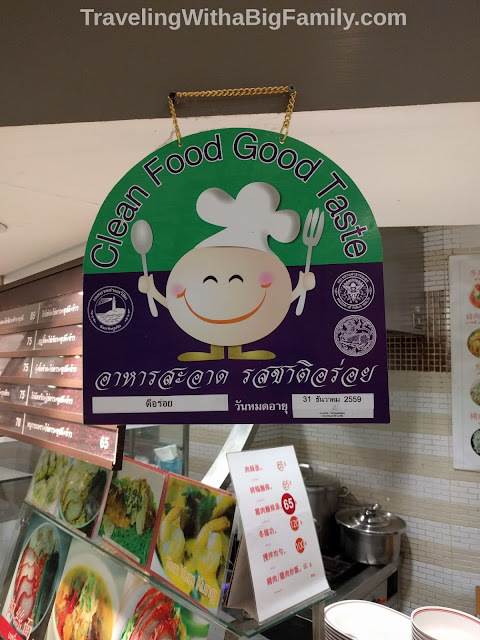 One thing I definitely noticed, and very much appreciated, at every Thailand food court we visited was that the meat was kept in a refrigerator until we ordered the meal, then it was cooked right in front of us - starting from cold and raw, not from pre-cooked-who-knows-when then merely heated up. We've eaten at many places around the world - street carts and roadside food stands catering to bus travelers - where when you order the food, they reach under the counter or into a box, and pull out some cooked food that already has grill marks on it, then they make a big show of "cooking" it, when all they are really doing is re-heating it. Or in some places, people climb onto the bus with trays of cooked food, trying to sell it to bus passengers. That whole scene can be just fine, or, it can be very bad news - who knows how many hours ago, or what day even, that food was cooked. Who knows what the temperature was when it was stored, or whether it was kept away from flies or bugs. I've seen cooked meat stored outdoors in closed boxes at roadside food stands, when the ambient temp was over 90 degrees, in some other countries (ahem, Hi there, Greece, and Guatemala!). But one thing I loved about mall food courts in Thailand: the food was handled the same way I would have done it in my own kitchen. 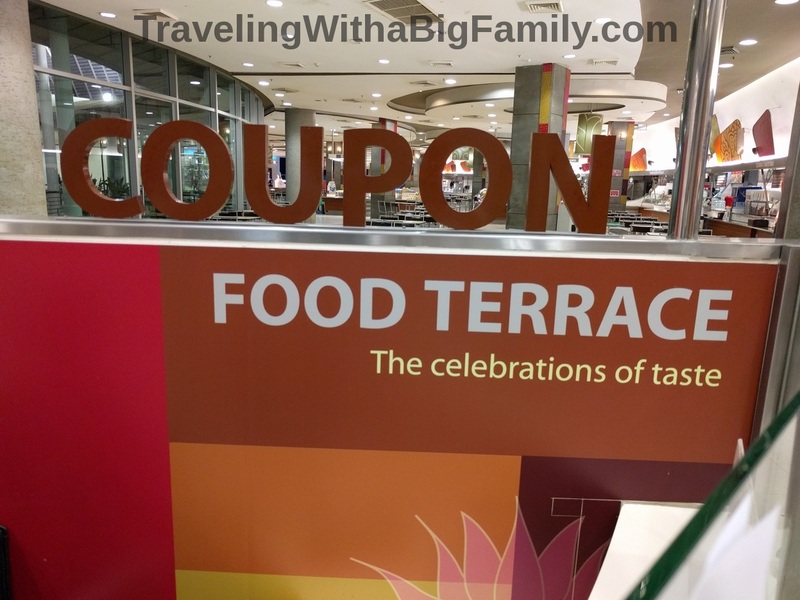 Delicious, inexpensive, safe, and fast meals at mall food courts: we loved it, every time, without exception. We visited mall food courts in nearly every town we visited in Thailand. It's a great place to take your kids to eat in Thailand. 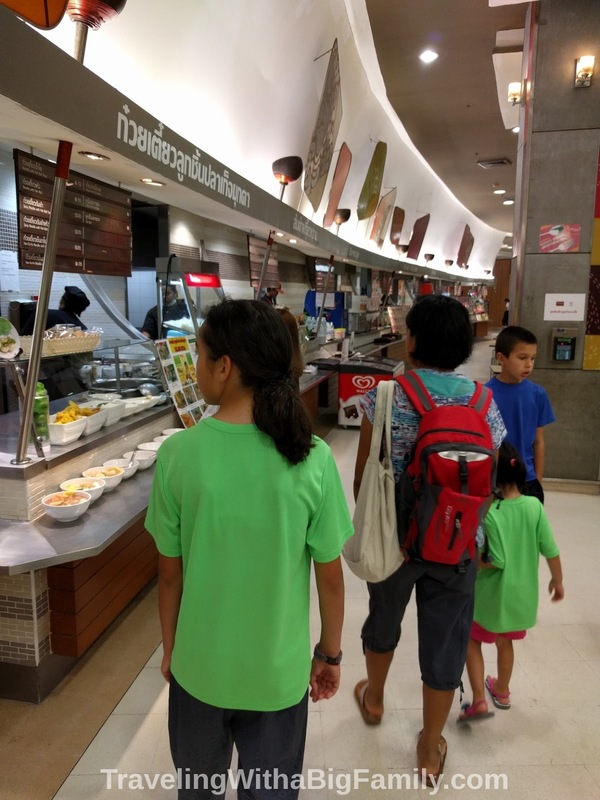 What do your kids like to eat while traveling?